Gingerbread goes hand in hand with the holidays. Its spicy warmth is irresistible on those cold winter nights in front of the fireplace or admiring the Christmas tree. We often associate gingerbread with cookies or even houses these days, but it actually takes many different forms – often depending on its European origin. This cake form is now considered particularly old fashioned. The recipe is adapted from “The James Beard Cookbook” and when it was published in 1959, James Beard was already describing it as truly old fashioned – which means it’s pretty darn old. However, classics such as these are timeless and good food never gets old especially if the ingredients and preparation remain simple. I couldn’t resist adding a twist to the whipped cream, a must-have on top of each steaming hot piece. The cinnamon and cloves get along famously with citrus so a touch of fresh zest along with the juice of an orange, balances the spicy sweet flavors of this understated holiday specialty. My grandmother used whipped cream in many of her desserts. She actually has a page in her baking book devoted to how to make, flavor, and stabilize it. 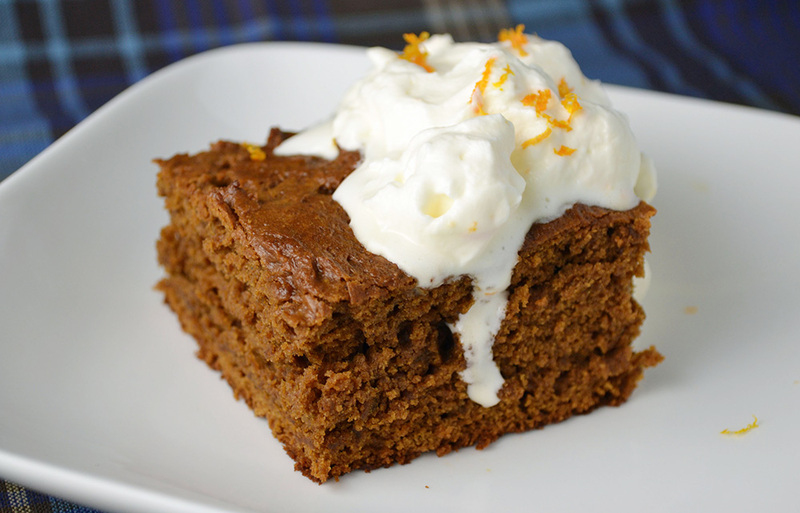 I like to think of this combination of old fashioned gingerbread with orange scented whipped cream as a joint recipe among two accomplished friends (James Beard and my grandmother, Paula Peck). Preheat oven to 350 degrees and grease an 8×8 cake pan. Put molasses and butter in a saucepan and heat until they boil. Sift the flour, salt, ginger, cinnamon, and ground cloves. When the butter and molasses are slightly cooled, add sour cream and then stir in spices and flour. Pour into prepared baking pan and bake 30-40 minutes or until a cake tester or toothpick comes out clean. 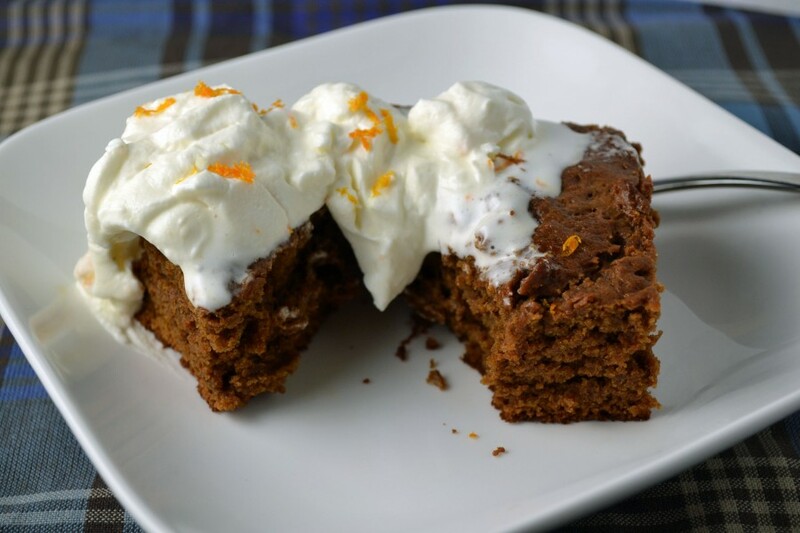 Serve warm with a large dollop of orange scented whipped cream. Whip heavy cream in an electric mixer. When cream begins to thicken, gradually add sugar, vanilla, and orange juice. Fold in orange zest. Gingerbread recipe adapted from “The James Beard Cookbook,” by James Beard. I made the James Beard gingerbread many times over the years and went to make it this year but found my mother no longer had his cookbook. I used your recipe and knew when I mixed it it was different — I’ve now found the original recipe and see that James Beard used one cup of butter whereas you use 1/2 cup of butter. The resulting batter (from your recipe) can NOT be poured! My gingerbread is still cooling but as it’s for Christmas Day I fear I will have to serve it as is. Is the recipe you’ve listed an error? Hi David, I’m sorry you had trouble with this recipe. The 1/2 cup of butter is not an error and normally works well in this recipe. Also, I reviewed the original Old-Fashioned Gingerbread recipe on page 68 of The James Beard Cookbook by James Beard and it lists a 1/2 cup butter as well. Perhaps you are referencing a different recipe (James Beard has many books)? I do test the recipes on this site and never post anything that doesn’t work or taste good. I hope the gingerbread works out well for you. Merry Christmas. My guests liked what I made from your website but I recall this recipe (with the one cup of butter as listed) as being lighter … and pourable.